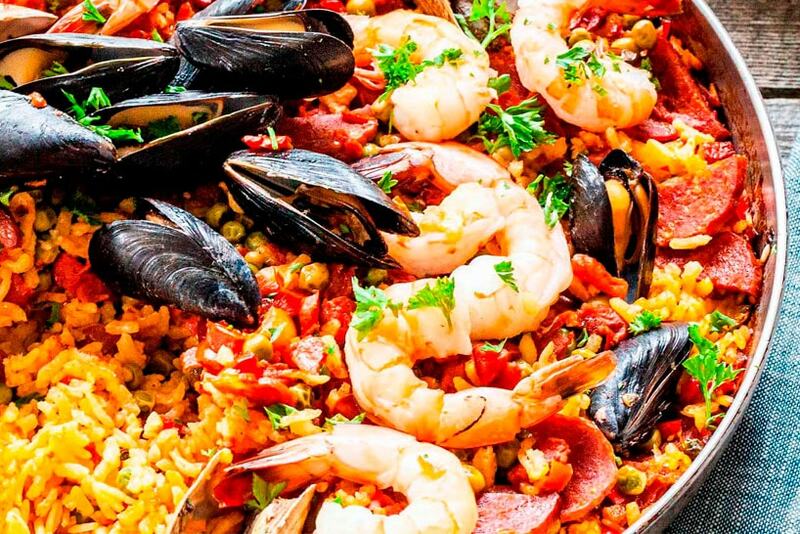 Although traditionally made by fire, paella can also be made in the oven. It takes longer, as the heat applied is not as intense, but the result is also very good. This Oven baked Paella is very tasty! It is important to put the seafood the last few minutes so that they don’t get too dry. Surely if you follow these steps, you will get a delicious oven-baked Paella! Which paella pan to use? Heat the olive oil in a paella pan or frying pan suitable for placing in the oven, at a medium temperature. Add the onion to the hot oil and sautée for 5 minutes. Next, remove the seeds from the pepper and chop it into small cubes, add it to the frying pan and sauté it with the onion until it softens slightly. Then add the chorizo and chopped garlic and stir all while cooking for 1 minute. Add the tomato paste and paprika, stir and allow to sauté for another minute. Next, add a generous amount of salt and pepper and add the rice. Stir it to take color and crumble the stock cube into a cup of broth that you will then pour. Let everything cook until the liquid is absorbed, it will take about 4-5 minutes. Pour the rest of the broth and the saffron strands, and increase the temperature. Now cover the paella pan with aluminum foil and put it in the oven. Let it bake for 30-35 minutes until you see that the liquid has been completely absorbed. After taking the paella pan out of the oven and place the mussels, peeled prawns, sausages and peas on top, remove it, cover again and bake for another 10-15 minutes, until you see that the mussels have opened and the prawns are pink. Finally, remove it from the oven and leave it covered until ready to serve. If you see any mussels that have not opened, remove them. You can sprinkle some parsley on top before serving. The great thing about this Oven Baked Paella is that you don´t really need to be there while it’s cooking, let the oven do the work!